Some of the best aircraft in the world are inspired by unique birds, and this zero emissions jet concept from designer William Brown is no exception. 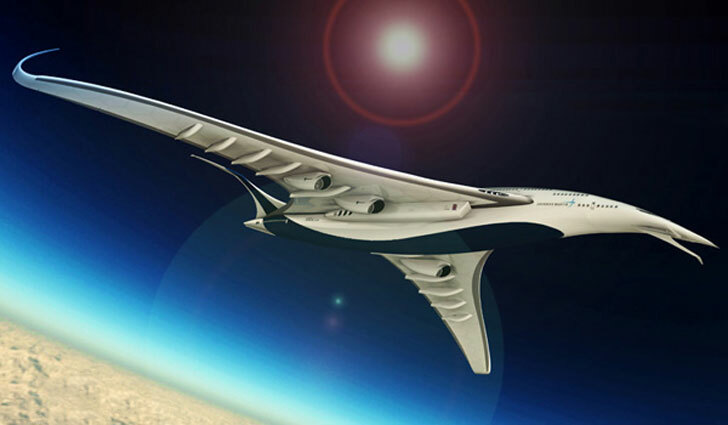 The Lockheed Stratoliner is a hydrogen jet that uses oversized wings to create extra lift for extended high-altitude flights. The design was inspired by the Bar-tailed Godwit, an Australian bird that holds the record for the longest nonstop flight (7,258 miles from Alaska to Australia without feeding!). Like the Godwit, the Stratoliner can go anywhere in the world without refueling. The zero-emission engines are just as out there. They are called Cryogenic Hydrogen Turbofan engines, and can operate in a low power mode like fighter jet engines to save a significant amount of fuel. All that boils down to an eco-friendly aircraft that can fly anywhere on earth without a pit stop. The large aircraft has an interesting front end and a unique split tail, but we’re not so sure it’s the most aerodynamic shape possible. Time will tell if Lockheed adopts a similar concept for a hydrogen aircraft. Now someone needs to come up with a way to make hydrogen cheaply and efficiently - making hydrogen with current technology uses more energy than the hydrogen it produces will produce. It's the Willy Wonka Golden Ticket to the planet's future. On a minor point - I didn't think the Godwit was Australian - they're Kiwi and Siberian too - one of the great winged wanderers. As a kid in New Zealand I used to watch them take off in huge numbers for daily training flights out to sea, preparing for their annual trip to Siberia. Why not label stories like this as a design study - since it's obvious that there's no real science involved.